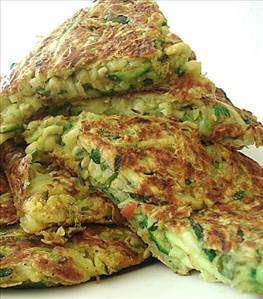 Quick and delicious zucchini fritters. Put all ingredients except the oil in a bowl and mix well. The moisture that comes from the zucchini may be enough to turn this into a batter. If not, add water but be sure it is not runny. The batter will be real thick. Add 1/3 cup of the mixture to the pan forming 3-4 pancakes, spreading them with the back of a spoon. Brown on one side for 5 minutes, flip the pancake and cook the other side for 5 minutes. 35 members have added this recipe to their cookbook. Roasted vegetables - alkaline friendly. Refreshing and tasty way to eat cauliflower through the summer. Quick, easy evening or lunch meal. There are 83 calories in 1 serving of Zucchini & Chickpea Flour Fritters. Calorie Breakdown: 32% fat, 49% carbs, 19% prot.